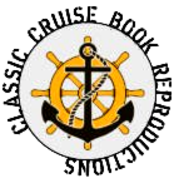 If after you receive your quote and you would like to proceed with your order and pay by check or money order, please make checks/money orders payable to "Classic Cruise Book Reproductions", and mail to 5943 Hunter Crest Rd., Woodbridge, VA 22193. If you would like to pay with a credit card please contact us at (703) 447-7160 (Cell) or (703) 897-4737 (Office). We can take your information over the phone to complete your order. If you would like to utilize PayPal, once you indicate the option you would like, we will email you an invoice.